Exporter of a wide range of products which include circular metal bandsaw cutting machines, circular metal saw machine and circular cutting machine. 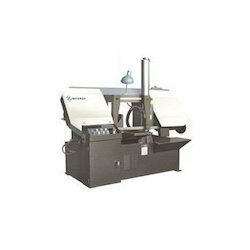 Featuring adjustable horizontal and vertical operating positions, Circular Metal Bandsaw Cutting Machines offered can be used in different cutting speeds as per the material that needs to be cut including brass, aluminum and tool steels. Available in different size blades and heavy-duty stand with two wheels, some of its features include adjustment for gravity feed cutting pressure, heavy duty stand support, safety lock-off support, steel and cast iron construction, rigid body construction that offers high blade tension, guides for upper and lower ball bearing blade and others. 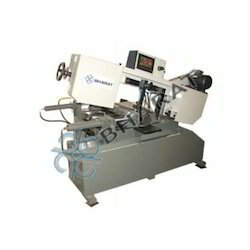 Providing working support as a power saw, these Circular Metal Saw Machine make use of toothed/abrasive blade for achieving perfect cutting action using rotary motion support. A hole saw and ring saw also uses a rotary motion but are different from a circular saw. Some of its features include allowing cutting many materials like plastic, wood, masonry, available in hand-held or machine mounted finish, enhanced design features with precision cutting height adjustment, allowing for quick change support, sheet steel based fabrication that allows higher blade tension as well as reduced blade vibration and increased working accuracy among others. Finding suitability in cutting of rings, disc, circles developed using mild steel sheet, Circular Cutting Machine offered come with stand, motor attachment and reduction gear support for optimum performance. 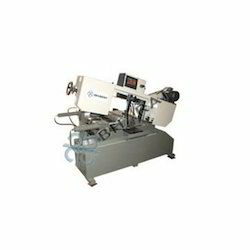 Also finding suitability for strip cutting operations, these hand operated machines also provide faster cutting support in comparison to other similar machines available in the market. Some of its features include suitable for cutting both ferrous and non ferrous metals, allowing cutting of channels, solid bars, hollows and other sections of ferrous/non ferrous metal, accurate and compact designed machine, having high production rates and providing good surface finish.